There are a couple of interesting items in Vol. 224, MIL. L. REV. MILITARY JUSTICE INCOMPETENCE OVER COMPETENCY DETERMINATIONS, by Major David C. Lai. This is relevant to me because I have an appellate case where there are issues with the client’s current competency and there were at trial. ALWAYS ON DUTY: CAN I ORDER YOU TO REPORT CRIMES OR INTERVENE? By Major Matthew E. Dyson. This is highly relevant in regard to the ongoing sexual assault issues and considerations of by-stander behavior. Compulsive lying, or mythomania, can be common in people with Borderline Personality Disorder. 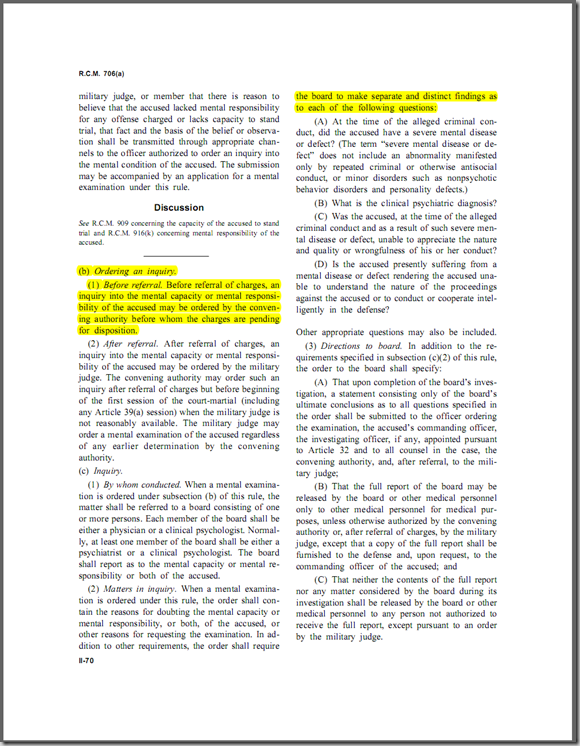 WHETHER THE MILITARY JUDGE ERRED BY ACCEPTING APPELLANT’S PLEA OF GUILTY AND NOT REOPENING THE PROVIDENCE INQUIRY WITHOUT QUESTIONING BOTH APPELLANT AND HIS TRIAL DEFENSE COUNSEL REGARDING APPELLANT’S BIPOLAR DISORDER, HIS EXTENSIVE HISTORY OF PSYCHIATRIC DISORDERS, AND POSSIBLE MENTAL RESPONSIBILITY DEFENSE. Moved by a huge tide of troops returning from Iraq and Afghanistan with post-traumatic stress, Congress has pressured the Department of Veterans Affairs to settle their disability claims — quickly, humanely and mostly in the vets’ favor. This 1969 photo shows Keith Roberts in Navy uniform. Starting in 1987, Roberts filed a string of disability claims with the Veterans Affairs, eventually blaming PTSD for everything from smoking addiction to arthritis. In 1999, Roberts was declared 100 percent disabled and got a lump sum payment, retroactive to August 1993. He was convicted of wire fraud, sentenced to 48 months in prison and ordered to pay $262,943.52 in restitution. The problem: The system is dysfunctional, an open invitation to fraud. And the VA has proposed changes that could make deception even easier. PTSD’s real but invisible scars can mark clerks and cooks just as easily as they can infantrymen fighting a faceless enemy in these wars without front lines. The VA is seeking to ease the burden of proof to ensure that their claims are processed swiftly. There is an interesting appellate procedural history. The court intially denied various efforts to have a post-trial R.C.M. 706 evaluation. But, the court did sua sponte reconsider the denial and did order a new R.C.M. 706 examination. On 6 January 2010, the ordered R.C.M. 706 evaluation report was released. 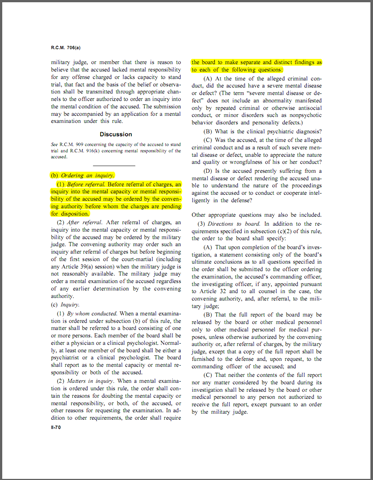 The evaluation found that during all relevant time periods, the appellant suffered from Schizophrenia (paranoid type), a severe mental disease, but that at the time of his offenses, the appellant was able to appreciate the nature and quality of his actions. The report, however, concluded that at the time of his trial, the appellant’s mental disease rendered him unable to understand the nature of the proceedings against him or to cooperate intelligently in his defense. A lieutenant colonel said because he suffers from kleptomania he should not be court-martialed for shoplifting last year at Fort Benning, Ga.
Lt. Col. Rodney Page, a 28-year Army veteran, admits to stealing $37 worth of challenge coins at the post exchange, but he blames the Army for mistakenly reducing medication he takes to curb his urge to steal. If Major Hasan raises an insanity defense for his acts at Fort Hood, how might the defense actually work if at all. Presumably he will present a combination of witnesses and documents. The media is reporting that prior to reporting to Fort Hood Major Hasan had “problems” so there will be witnesses to odd or strange behavior; there will be witnesses to the nature of his work and whether he could suffer vicarious traumatization; and there will be other witnesses to how he behaved. Then there may well be psychological testimony. In Part I, I briefly outlined the formal examination process prior to presenting an insanity/lack of mental responsibility defense. 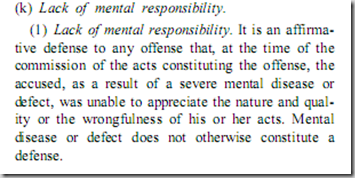 Now here is some information on the “law” or legal standard for an insanity defense. This is the defense that Major Hasan and his lawyers are going to have to consider for his actions at Fort Hood. The outlines can be found in Rule for Courts-Martial (RCM) 916(k). The military (insanity) lack of mental responsibility defense is set out in several places relevant to Major Hasan and the events at Fort Hood. The first step that should be taken by a prudent convening authority in this case is to order a mental examination under R.C.M. 706, as soon as Major Hasan is medically fit. Major Hasan and his counsel could arrange for a private examination at the major’s own expense. But should they attempt to put on an insanity/lack of mental responsibility defense the prosecution will certainly persuade the military judge to order a government examination. There are two reports: the first is a short form with the answers to the basic questions. The short form is given to the commander at Fort Hood, his legal advisor, the prosecution, and the military judge. A long and detailed report is given only to the defense. Thus the examination and a large part of the work is privileged. Mil. R. Evid. 302 sets out the privileged nature of the examination, and the exceptions. The defense becomes the gatekeeper of the report. Should the defense seek to put on a lack of mental responsibility (insanity) defense the report may well have to be disclosed. Should the examination find the major currently incompetent, then he’s off to the federal confinement facility at Butner, NC, under Article 76b, UCMJ. There is currently one service-member at Butner under Article 76b. Will Major Hasan successfully use PTSD as a defense, or will it at least become a mitigating factor to be considered. If the trial is at Fort Hood, as seems likely at the moment, many of the Members (jury) panel will already have quite a bit of extra-judicial information. Here are some links relating to secondary traumatization. Zimmering, Munroe, & Gulliver, Secondary Traumatization in Mental Health Care Providers, 20 Psych. Times (Apr. 2003).